, tools to meet your needs today and ensure your continued success tomorrow. 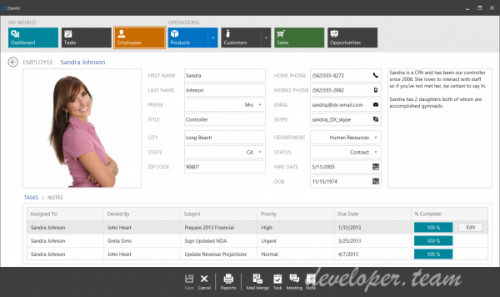 With over 120 optimized controls and libraries, the DevExpress WinForms Subscription helps you deliver compelling, easy-to-use business solutions fast. Emulate the look, feel and capabilities of Microsoft Office or replicate the dock based UI of Visual Studio or Adobe Photoshop and take your WinForms applications to an entirely new level with familiar features end-users have come to rely upon. It’s everything you need to build your best in one integrated suite. Scaffolding wizards available from the DevExpress Template Gallery and numerous tutorials included into our ‘MVVM Best Practices’ WinForms demo help you master usage of the DevExpress MVVM Framework and build scalable, maintainable and testable enterprise applications for WinForms. The new WinForms Adorner UI Manager is a transparent layer drawn on top of all other UI elements. Its designed to display objects and visual effects to better communicate the state of your application to end-users. You can use it to draw badges, highlight focused UI elements, display visual effects when validating data editors, etc. With this release, we’ve introduced Right-To-Left (RTL) support across the following DevExpress WinForms controls.